Please see our Shipping Zones guide and create zones to begin using. 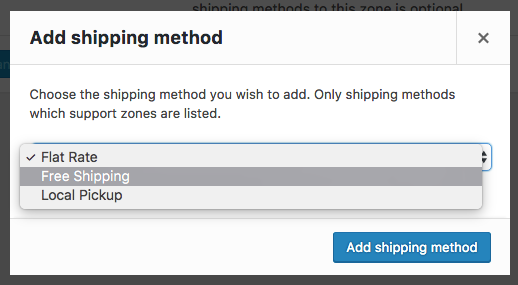 Select a Shipping Zone, and click the + icon to Add Shipping Method. A modal window will display. Select Free Shipping from the dropdown and Click Add shipping method. Click Free Shipping in the row you wish to define. This takes you to a different screen to configure the free shipping method for that specific shipping zone. Enter a Title that displays to customers in checkout. 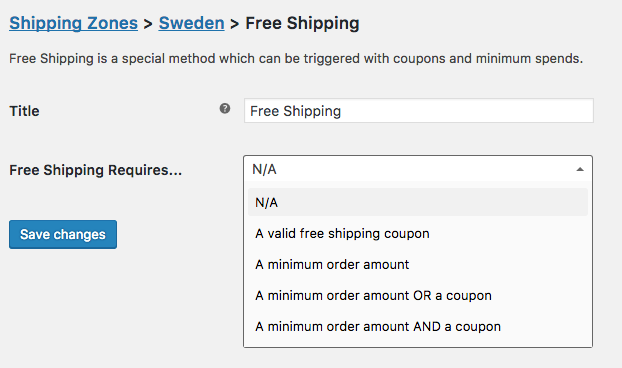 Select Free Shipping Requires… in the dropdown. Enter a Minimum Order Amount (if applicable). Tick the Allow Free Shipping checkbox. More info at: (Coupon Management). Enable free shipping for coupons. Go to the Free Shipping option you set up. Select the option A valid free shipping coupon from the dropdown (#7 above). Customers can now use the coupon to get free shipping. If you have coupons for free shipping and a minimum amount set, coupons take priority. Minimum amount is ignored when the customer has a coupon. If, however, the user doesn’t have a coupon, minimum amount will be checked. This means you can use add_filter() on woocommerce_shipping_free_shipping_is_available and return true or false. You need to set up at least one Shipping Zone. More at: Setting up Shipping Zones. Then follow steps above in Setup and Configuration, paying particular attention to #7, selecting A minimum order amount from the dropdown, then enter the amount (e.g., $25 or any amount you wish) in step #8. How can I set up free shipping for orders over ___ ?